Frosty Blue ceanothus is a fast-growing evergreen shrub for full sun or light shade. 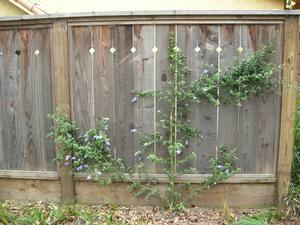 It grows to about 8-10' tall and 8-10' wide. Large clusters of vivid blue flowers bloom in spring and have white "frosting;" hence the plant's name. Frosty Blue was selected in 1965 by Percy Everett, Superintendent of the Rancho Santa Ana Botanic Gardenin Claremont, California. It was named by John Dourley in 1970 and introduced into the nursery trade in 1974. 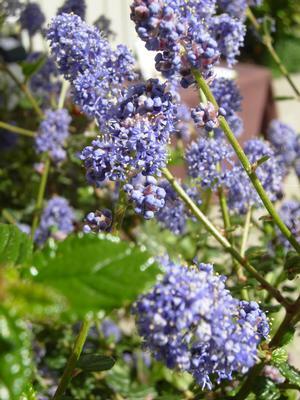 The exact parentage of this hybrid ceanothus isn't certain, but David Fross and Dieter Wilken's say in their 2006 book "Ceanothus" that Ceanothus impressus and Ceanothus thyrsiflorus var. griseus appear to play a part. Frosty Blue has an upright growth habit and is a really fast grower. You can expect it to put on at least 3', perhaps more if you have decent soil, in its first year in the ground. In about 3 years, it'll reach its full size of around 8-10' tall and wide. The oval leaves are fairly small - about 3/8" wide and 1/2" long - and a handsome dark glossy green. Frosty Blue can bloom a little later than some ceanothus. Here in Soquel (just south of Santa Cruz, CA), it usually starts flowering in the second half of March and puts on an impressive display through May. The 2-4" long clusters of bright blue flowers look as if they're tipped with white frosting, hence the cultivar name. This "frosting" is actually the white bracts on the flower buds (a bract is a leaf-like structure that grows just beneath a flower). Most books say that Frosty Blue's best grown in full sun, both on the coast and in warmer inland areas. We've found it to be quite happy in light shade though. It's growth habit isn't quite as dense in the shade, but it still has good form. In coastal areas, it's tolerant of both wind and salt spray. Frosty Blue's one of the most adaptable ceanothus. It tolerates most soil types including heavy clay and sandy soil. It just doesn't want to be in a spot that's permanently waterlogged. Las Pilitas Nursery reports that it may have some initial problems with chlorosis (yellowing of the leaves) in alkaline soils, but this usually resolves itself in time. Once established, Frosty Blue will survive - and be perfectly happy - on rainfall alone in coastal areas. If you want to plant it, though, in an area where it gets overspray from a sprinkler system then it will easily handle the supplemental water. Like all ceanothus, Frosty Blue is a valuable nectar source for many butterflies, bees and other insects. You'll probably find that deer find Frosty Blue fairly tasty, so you may want to protect it from browsing for the first few years. If you're growing Frosty Blue as a shrub or small tree, an annual pruning in early summer will help to shape it as required. Cut out any stems that cross each other and remove any wayward stems. If you're growing Frosty Blue as an espalier, you'll need to tie in any stems against the wall or fence as well as pruning. Because Frosty Blue grows fast, you may need to tie branches in two or three times a year for the first few years in order to create the desired framework of branches.